IRST is a sensory device which uses IR (infrared) radiation for detection and targeting purposes. IR radiation has wavelength of 0,75 to 1.000 microns (micrometers), longer than wavelengths of color red in the visible spectrum (visible spectrum ranges from 0,39 to 0,7 microns, with violet at 0,4 and red at 0,7 microns). It is given off by all objects above absolute zero, though objects that are below average temperature of their surroundings will absorb far more IR radiation than they will give out. Unlike FLIR which is a targeting device, IRST can be used for initial detection as well. Infrared radiation is divided into near infrared (0,75 – 1,4 microns), shortwave infrared (1,4 – 3 microns), midwave infrared (3 – 8 microns), longwave infrared (8 – 15 microns) and far infrared (15 – 1.000 microns). These have different properties. For example, glass is opaque to LWIR band but transparent to SWIR band, and significantly degradess image in MWIR band. MWIR sensors are far better at penetrating fog and clouds than other wavelengths, while LWIR sensors have superior atmospheric performance. As a result, while SWIR sensors can use glass, MWIR and LWIR sensors have to use exotic materials such as germanium and sapphire. 5-7 micron band suffers 100% absorption by water particles. IR bands are also associated with temperatures of bodies producing radiation. Visible light is associated with temperatures above 1.000 *C. Next come IR bands: 0,7-4 microns (1.000 – 400 *C); 5-25 microns (400 – -150 *C) and 25-350 microns (this is a civilian, not military, division). Bodies at room temperature have radiation peak at around 10 microns, while 3-5 micron band is used in civilian applications for its effectiveness in tropical conditions. In civillian purposes, astronomers use IR telescopes to penetrate dusty regions of space that block off visible light. 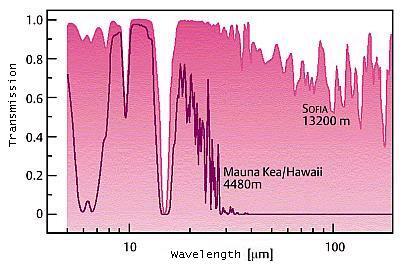 NASA also has an airborne IR system – SOFIA (Stratospheric Observatory for Infrared Astronomy) which is flown at altitudes of over 41.000 ft, allowing 85% of the entire IR spectrum to reach it. Its service ceilling is 45.000 ft.
First IRSTs were deployed in 1950s on F-101, F-102 and F-106 interceptors. They were also used in F-8E, F-4 (B and C models only) and Swedish J-35A and J-35F-2 (1965-1967). However, they were primitive and were slaved to the radar, as opposed to modern-day independent systems. Any IR radiation falling on the sensor would generate a blip; consequential high false alarm rate meant that IRST was typically only used for (manual) radar targeting. In 1960s and 1970s, Soviets deployed IRST units on their MiG-23, MiG-31, Su-27 and MiG-29 fighters. This was intended to provide passive BVR surveillance capability to fighters, and also as a way of countering Western advantage in radar technology and countermeasures. In fact, MiG-23 and MiG-31 interceptors were able to track the SR-71 recon aircraft from large distance, possibly up to 100 kilometers. This was despite the fact that the system was rather primitive, and that MiG-31s own skin and canopy would reach temperatures of over 760 degrees Celsius during the intercepts. MiG-23 had an IRST capable of detecting the F-16 at 35-40 km head on and 60 km from the rear. Later developments of Su-27 and MiG-29 families all have internal IRST. Due to relatively shorter wavelength, IRST is more sensitive than radar to adverse weather conditions. Much of the infrared radiation is absorbed by water vapor, carbon dioxide, methane and ozone. However, there are two wavelength “windows” in which very little infrared radiation is absorbed by the atmosphere. These windows are at 3-5 and 8-12 microns. Both modern IRSTs and modern IR missile seekers typically operate in both bands. 3-5 mM band is optimized for detection of aircraft in afterburner, while 8-12 mM band is better suited for detection of subsonic or supercruising aircraft through aerodynamic heating of skin. More specifically, afterburner exhaust plume is more prominent in midwave than in logwave band, with most emissions being in 2-8 mM wavelength band, while emissions from nonafterburning plume are only useful in 4,15-4,2 mM band. Blackbody radiation from a warm object is most prominent in 10-15 mM band, and only objects above ~300 K give appreciable MWIR emissions (still inferior to to LWIR band). As a result, LWIR detectors have good sensitivity against targets at ambient temperatures. Unlike other IR bands, these two bands are comparatively altitude-insensitive when it comes to detection performance, as it can be seen from an IR absorpion chart in the next section; they are also less affected by water content. Comparing both bands, 3-5 mM band is less affected by aerosoil while 8-12 mM band has longer detection range and is less affected by clouds. Consequently, up until appearance of dual-band systems, midwave band was preferred for ground attack while longwave band was preferred for air-to-air usage. While IRSTs can detect even relatively cool targets through thin cloud cover, detection range is reduced (more than it is in case of radar), and thicker clouds can significantly degrade detection range. As a result, IRST is most useful for air superiority fighters, which typically operate at 30.000 ft and above – well above normal cloud cover and in relatively thin atmosphere. * ** Only clouds typically present at altitudes above 8 km (~26.000 ft) are those of cirrus variety, which are IR transparent. While dense cumulonimbus clouds can reach extreme heights (60.000-75.000 ft), it is very rare; vast majority does not reach above 20.000 ft. 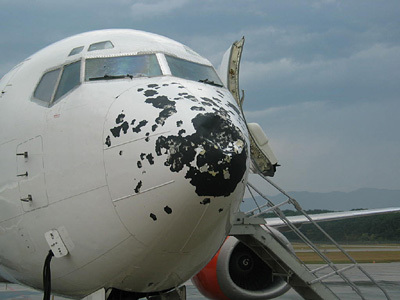 They are also very hazardous to aircraft (especially those of stealth variety), with frequent lightning discharges and large hailstones ranging from 0,5 to 5 cm in diameter, which can damage aircraft’s skin. Due to its passive nature and shorter wavelength, IRST has major advantages over radar regarding ID capabilities and ground attack performance due to increased resolution. In particular, IRST has better ability to project image of the target (to either cockpit displays or HMD), thus giving a fighter aircraft ability to ID other aircraft at longer ranges than would be possible with radar NCTR modes. IRST also has beter capability for differentiating aircraft in formation than radar does due to better angular resolution – possibly up to 40 times more accurate than radar’s. Still, IRST might have a regular magnified optical sight added for help with identification in clear weather. Type and location of IRST is indicative of aircraft’s mission. Air superiority fighters will have dual band or longwave system positioned in front of the canopy on upper nose surface, while ground attack aircraft will have a dual band or midwave system positioned below the nose. Dual band system is preferable in both cases as it helps eliminate clutter, though it is not as beneficial for ground attack aircraft as it is for air superiority fighters. Major advantage over the radar is that it cannot be easily jammed. As a result, actual tracking and engagement range of IRST can be expected to be greater than that of radar, even if latter has a major advantage in initial detection range. Jamming IRST with an infrared laser is a possibility (in theory), but it is very difficult if not impossible to pull off against a maneuvering aircraft. Operating modes are similar to radar: multiple target track (permitting engagement of multiple targets; similar in nature to radar’s track while scan), single target track and slaved acquisition (where IRST is slaved to another sensor, such as radar or RWR). Being a passive sensor, IRST alone has issues with range finding. There are some workarounds. Obvious one is laser rangefinder, but being an active sensor it means that the target is warned of the impending attack (IRST still retains its passive surveillance advantage over the radar). Second one is triangulation, which can be done in several ways: datalinking two or more aircraft together, flying in a zig-zag / weaving pattern and measuring apparent target shift, or flying in straight line perpendicular to the target while doing the same. First two are usable against aircraft, while last one is only practical against ground-based targets. Target motion analysis can also be combined with atmospheric propagation model and/or apparent size of the target in order to provide a more accurate rangefinding, or these modes can be used as standalones. Radiance difference between target and the background is also a possibility. Doppler shift may be used to provide estimate of target’s speed relative to the fighters, which can be used to help with rangefinding; this is still questionable as it does not show up well at short distances, measurement may be impeded by the atmosphere, and is typically used by platforms and against targets with relatively predictable paths, which fighters are not. Exception is radar ranging, but in this case wavelength is already known beforehand to a great degree of precision. That being said, the only determinant for Doppler shift is relative speed of sensor compared to the object emitting radiation – and modern IR sensors used in astronomy can measure velocity of a star down to 1 meter per second (relative to Earth). For comparison, speed of sound at >=40.000 ft is 294,9 meters per second, and two closing fighters will be doing it at relative speeds between Mach 1,5 and 3,6. It is questionable wether Doppler shift is, or may, be used in airborne IRST. It should be noted that while not knowing range of the target limits maximum engagement range, it does not preclude beyond visual range engagement, as missile can fly along the line of sight towards the target. This does create issues with end-game engagement, though a missile with active radar head is capable of pulling a lead, and even one with IR head might be capable of doing so albeit with less precision. Such engagement profile is in some ways superior to the classical one, as IRST’s greater angular precision will mean less possibility of a missile flying past the target without acquiring it. Imaging IRST can also be used as a landing aid in no or poor visibility conditions (night, fog, rain etc.). While helpful for any aircraft, this is especially important for fighter and ground attack aircraft expected to operate from austere air strips. It should be noted that IRSTs detection range is range at which probability of detection exceeds ~95% treshold, in clear-sky conditions. Actual range at which target is detected can be higher or lower. Also, heating of sensor due to friction during high-speed flight can degrade its performance somewhat. While modern QWIP IRSTs offer the best performance, they have to be cooled to extremely low temperatures: 65 K is not uncommon. Quantum well is a potential well in which electrons are trapped. When excited, they can be ejected from the well, and produce current if external voltage is applied. QWIP photodetector / IRST can measure how much light comes from various sources by measuring the current. The longer the wavelength of light, the less energy the light has to give the electrons and the colder the detector must be to avoid excessive thermal excitations. IRST can use scanning or staring array. Staring sensor uses one detecting element for each part of the image within field of view. This means that all detecting elements are simultaneously exposed to the image of the object, or a frame. Standard frame rate is 30 Hz, and dwell time is equal to the frame rate (1/30 of a second). Longer dwell time results in a more sensitive detector and less noise. Scanning system can use a single element, which then sequentially scans the instantaneous field of view (determined by the aperture). Scanning system is typically a rotaring mirror. This system is cheaper than a staring array. Its output is serial as only IFOV is directed on the detector at any one time. Dwell time is determined by both frame rate and number of pixels in the image; a system with 30 Hz refresh rate and standard VGA monitor of 640×400 pixels has a dwell time of 1/7.680.000 od a second, which leads to increased noise in the system and reduced sensitivity. (Note that a staring array still can be mounted in a turret which can scan the area in front of the aircraft). *French Dassault Rafale has an optronics suite (IR+visual) and radar. Radar is considered primary air-to-ground sensor, while OSF is considered primary air-to-air sensor. ** F-35, a ground attack aircraft, will also typically fly at 30.000 ft during ingress/egress. It is a general wisdom that IRST is of limited usefulness due to its sensitivity to adverse weather conditions. However, most modern stealth fighters (excepting the F-35 and J-31 tactical bombers) are intended to operate at high altitudes – above 50.000 ft – where ambient temperatures range from -30 to -60 degrees Celsius, which helps provide excellent contrast. Air at this altitude is also very dry, with 99,8% of the atmospheric water being below 45.000 ft. Combined with low air density and low aerosoil content, this means that there is very little atmospheric absorption of IR radiation. This applies especially to the longwave band, but detection capability is significantly improved in most bands as can be seen from the image below. Stealth aircraft are designed to have certain IR signature reduction measures, but effectiveness of these is rather limited due to basic physics. To fly, aircraft has to overcome two basic forces: gravity and drag. Drag is created due to friction with air, compressibility effects and lift. To overcome gravity, aircraft needs lift. To generate lift, aircraft has to move forward and overcome drag. As a result, aircraft has to perform work – which creates heat. Indeed the largest IR sources on the fighter aircraft are its engines. Jet engines work by burning fuel in order to heat up huge quantities of air, which is then propelled out of the rear in order to push the aircraft forward. This leads to significant heat – engine itself is very hot (especially turbines), as is the exhaust nozzle. Engine heats up airframe surrounding it, which can be detected. Exhaust plume is also very hot, though much of the radiation is typically absorbed by the atmosphere (this depends on the altitude – refer to the image before this paragraph). Other than the engines themselves and their exhaust, there are other sources of IR radiation. Any moving objects have to push the air out of the way. If object is fast – for example, an aircraft flying at high subsonic or supersonic speeds – air cannot move out of the way quickly enough. This leads to compression of the air in front of the aircraft, which in turn leads to heating of said air. At Mach 1,7, a supercruising fighter generates shock cones with stagnation temperature of 87 degrees Celsius; shock cone forms above Mach 0,8 and at around Mach 1 it achieves temperature of -13 degrees Celsius. Shock cone also increases frontal area presented to the sensor about 10 times (its diameter depends largely on aircraft’s wing span). As the air moves out of the way for the aircraft, it also creates significant friction with the aircraft itself, leading to heating of the aircraft’s skin. In a jet fighter, hottest parts of the airframe other than the engine nozzles are tip of the nose, front of the canopy, as well as leading edges (of wings, tail(s) and air intakes). As mentioned before, MiG-31 would heat up to 760 degrees Celsius during intercepts due to aerodynamic heating alone. Airframe temperature due to friction can reach -29 degrees Celsius at Mach 0,8, 54,4 degrees Celsius at Mach 1,6, 83,3 degrees Celsius at Mach 1,8 and 116,8 degrees Celsius at Mach 2,0. F-22 has two pitot tubes – one at each side of the nose – which are heated to 270* C during flight operations to prevent them from icing at high altitude. Avionics have to be cooled – especially radar. Heat exhaust is typically located at fighter’s upper surface – just behind the cockpit in Gripen, and about one canopy length behind it for the F-22. F-35 is in even worse situation since it uses fuel as a coolant, and said fuel completely surrounds its engine. This has the effect of increasing its IR signature as well as the possibility of bursting into flames if hit. These temperatures can be compared to the ambient air (Standard US Atmosphere). F-22 achieves maximum cruise speed of Mach 1,72 at ~38.000 ft without afterburner, and maximum speed of Mach 2,0 at between 38.000 and 58.000 ft with afterburner. Above cca 53.000 ft it requires afterburner to fly, and can achieve maximum altitude of ~64.000 ft, where it is limited to maximum speed of Mach 1,6-1,8. Ambient temperature is -44,4 *C at 30.000 ft, -54,2 *C at 35.000 ft, -56,5 *C at 40.000 ft to 60.000 ft, and -55,2 *C at 70.000 ft. That is to say, difference between shock cone of a M 1,7 F-22 and ambient air will be around 130-145 * C, while temperature difference between airframe and ambient air will be cca 111 * C at Mach 1,6 and cca 172 * C at Mach 2,0. At Mach 1 difference will be 31-44 * C between shock cone and the ambient air; difference in temperature between airframe and ambient air will be 15-27 * C at Mach 0,8. IRST sensor of Dassault Rafale’s OSF can, at 20.000 ft, detect a subsonic fighter-sized target at 80 km from the front and 130 km from the rear. At low altitude, range from the rear is 110 km, which would indicate frontal range of 68 km. F-22 achieves supercruise speed of Mach 1,72-1,75 at 38.000 ft. 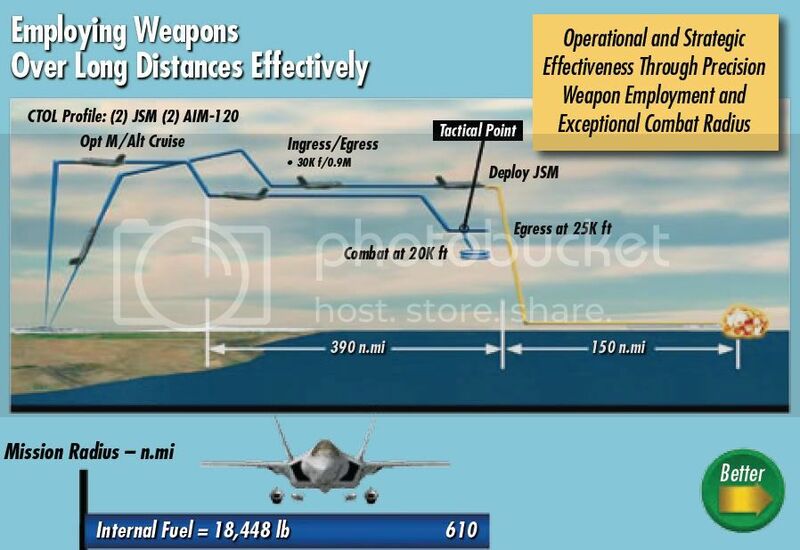 Assuming similar increase in range between 20.000 and 40.000 ft, OSF should be able to detect the subsonic F-22 at distance of 90-95 km from the front and 145-155 km from the rear. If F-22 is supercruising at Mach 1,70 and 40.000 ft (about the limit of its supercruise performance at that altitude), range increases to 270-285 km from the front and 435-465 km from the rear. While fighter’s IR signature can be reduced by reducing speed, such course of action also has the effect of reducing one’s own weapons range, as well as making a rear-quarter surprise more likely. In either case, fighter will get detected by modern QWIP IRST before it reaches missile effective range (10-40 km for AIM-120D at most, and can be as low as 2 km). It is possible to apply IR absorbent paints to a fighter in order to reduce IR emissions from systems inside it. This, at best, does not have any impact on aerodynamic heating. Some IR absorbent paints cause more friction than would otherwise be the case, increasing aerodynamic heating. RAM coatings also can increase friction. While it is not a significant factor in MWIR band, LWIR detectors can detect aircraft by detecting sunshine reflections from its surfaces, such as canopy. Modern IRST systems can even detect missile launch from its nose cone heating – this is in fact a significant advantage for IR MAWS, as UV MAWS cannot detect missiles that have spent fuel. They are also sensitive enough for planets, birds, and (in air-to-ground) barbecue grills to be sources of clutter. Note that even if an object is at the exact same temperature as its environment, it still emits blackbody radiation, most of it at longer wavelengths. Unlike radar, IRST is primarily a passive system. This allows a fighter aircraft, or a fighter group, to detect and track the enemy without latter being aware of their presence, thus gaining a significant initial advantage in the OODA loop. Even when the enemy is aware of the fighter’s presence, he has no way of knowing wether he has been detected, or is being targeted, until a significant shift in fighters’ posture (such as painting target with a rangefinder or shifting flight path or formation). For comparison, just turning on the radar warns the aircraft in very large area of scanning fighter’s presence – and said area is far larger than one covered by the radar. Not only does it give away fighter’s presence, but if the enemy has good enough listening equipment, it is possible to triangulate location and even identify the target through its unique radar signals. Even radio communications and datalinks can serve the same purpose. If the enemy is using radar, it is possible to use data from radar warner to generate a bearing, after which IRST can be used in a “stare” mode – continuous track, during which photon impacts are combined over prolonged timeframe to detect a target at greater distances than would normally be possible. This mode is also present in radar systems, and like IRST, radar also has to be cued by other sensors to make use of it. But while using radar in such a manner basically guarantees than the enemy with a competent RWR will detect radar transmissions, IRST is undetectable. Even a short radar burst can allow the passive fighter to generate such bearing, albeit it will somewhat limit the precision. If radars are jammed, or more likely turned off for fear of detection, first indication of IRST-equipped fighter’s presence that the enemy aircraft will get may be alarm from a missile warning system (or radar warning system if missile is using an active seeker), thus allowing only a short time for defensive reaction. (Simulated trials of ECR-90 have shown that its airborne detection range could be cut to less than 9 kilometers by jamming). If both sides have IRST, it comes down to sensor quality and IR signature differences. Aircraft equipped with IRST, and using IR MAWS, can remain completely silent during the mission. If the enemy has no IRST, then he will have to turn on his own radar(s), allowing the passive aircraft excellent situational awareness, well beyond what using radar in addition to IRST would allow. Further, active usage of radar will allow geolocation of radar emitters, allowing the passive fighter to use IRST to engage such targets with high precision – thus gaining a “see first, strike first” capability. IRST-equipped aircraft is also not vulnerable to anti-radiation missiles. (Note that such missiles are not very hard to make, with basically all air-to-air engagement radars being in X band). IRSTs shortcomings can be compensated for by using datalinks to network the fighter with other assets, such as other IRST-equipped fighters and radar-equipped AWACS. As a result, radar is not the primary onboard sensor any more, and is not actually even required. Using datalink from AWACS (though AWACS is unlikely to survive for long in a shooting war) or ground radars, fighter can then approach the enemy from side or rear, in order to prevent detection by enemy’s own radar and maximize IRSTs detection range. Once target is acquired on IRST, fighter can pursue engagement completely independently. Of course, if enemy fighter uses its own radar, no AWACS is required. It should be noted that most, possibly all, fighter aircraft today lack the datalink capable of transferring amount of data necessary for a firing solution. Even if such datalink is deployed, it will be easy to jam. As a result, fighters have to rely on onboard sensors to create a firing solution (when Rafale shot down a target at 6 o’clock, shot was done with onboard sensors and within visual range; F-35 may have a similar capability). Large radar-based fighters – such as the F-15, F-22, Flanker variants – can act as AWACS of sorts, providing radar image to smaller IRST-only fighters, which can then use such image to achieve optimal position for a surprise attack. This in turn will allow IRST-equipped fighters to focus the IRST and achieve detection ranges larger than could normally be achieved. Even if radars are jammed, radar-based fighters should be able to roughly tell positions of enemy fighters, unless DRFM, active cancellation or standoff jamming is used. Using IRST to generate a firing solution, and then launching an IR BVRAAM or ramjet RF BVRAAM (or, ideally, a ramjet IR BVRAAM, though such missile does not exist in Western inventory) at a surprised opponent will allow far higher kill probabilities than using an obvious radar for firing solution. Still, using an AWACS with a huge IRST plus extensive ESM arrays might allow the same tactics without a drawback of warning the enemy that he has been detected, and without suffering vulnerability to decoys and jamming that radar has. Additional advantage of such system is that its effectiveness will not be significantly degraded even against VLO targets. On the other hand, while bad weather degrades IRSTs performance, it also degrades performance of stealth coatings (assuming that stealth fighters can safely enter storm clouds), thus combining radar AWACS with IRST-equipped fighters does make some sense, as does using both types of AWACS. IRST is the best solution for engaging stealthy aircraft and cruise missiles. As it can be seen from the previous section, is impossible to significantly reduce IR signature of a high-speed, highly maneuverable aircraft, and even low-performance aircraft that do have very extensive IR signature reduction measures are still detectable at large distances by new QWIP imaging IRSTs. Even against “legacy” aircraft its is a better choice than radar, as radar cannot separate valid contacts from decoys except at very short range – especially if it is being jammed. As a result, only IRST-equipped fighters can effectively engage modern fighters at beyond visual range. IRST can be used as a relatively cheap way of turning an old, possibly even WVR-only, platform into one capable of BVR combat. With PIRATE + MICA IR combination, even an old F-86 would gain a capability to shoot down enemy fighters from beyond visual range (that being said, issues of low cruise speed, deficient acceleration by today’s standards and no defense suite at all would remain, and would mean that even against the F-35, F-86 would not achieve positive kill/loss ratio). Analytic simulations indicate that an IRST-equipped aircraft will have 230% better exchange ratio than a non-IRST equipped aircraft against a “legacy” target, and 370% better against a LO target. PIRATE is used by Eurofighter Typhoon, and it entered service in 2007. Its lead contractor is Selex ES. Selex holds the bulk of Western experience in IRST systems, and is also a sole supplier of the Skyward G IRST. Thales, another member of the Eurofirst consortium, also has extensive experience in the area. PIRATE is a dual-band system (3-5 and 8-10 microns), combining long range detection capability of the longwave IRST with high resolution and all-weather performance of midwave one. It can track more than 200 targets, and has 140* field of regard in azimuth, with -15* depression angle. Sensor head weights 48 kg, with 60 kg (?) total weight. Detection range against a subsonic fighter-sized target is 90 km from the front and 145 km from the rear. It has an ID range of 40 km, and can track a maximum of 200 targets. It is stated to be capable of passive ranging. Its ability to provide infrared image (which can be shown on cockpit displays and HMD) can, aside for ID purposes, also be used to help with flight operation in low visibility conditions. Skyward G is a new IRST intended for use in Gripen E/F, and represents a technological improvement (in both hardware and software) over older PIRATE IRST it is based on. It is a staring imaging IRST. It is also smaller, with sensor head weighting 30 kg. Like PIRATE, it is a dual-band system covering midwave and longwave infrared bands, and can provide IR image on pilot’s helmet. Scan coverage is 160* in azimuth and 60* in elevation. Skyward is stated to be capable of detecting all aircraft flying faster than 300-400 kts from skin friction alone – irrespective of any exhaust plume or engine IR signature reduction measures. Range for such detection is unstated. OSF is an optical sensors suite used by Dassault Rafale. It consists of an IRST sensor and a video camera. Like PIRATE, its IR sensor is dual-band, using 3-5 and 8-12 micron bands. Detection range against a subsonic fighter-sized target is 80 km from the front and 130 km from the rear (at 20.000 ft; 110 km at low altitude). Optical camera has ID range of 45 km, while IRST has an ID range of 40 (?) km. It was reported to have locked on a turboprop Transall through thin cloud cover. EOTS is a staring IR sensor. Unlike above IRST systems, it is primarily intended for ground attack, as a replacement for various IR targeting pods. As a result, it is a single-channel midwave IR system, limiting its detection performance against nonafterburning targets and in air-to-air role but providing all-weather performance. It weights 200 lbs / 90,7 kg. It is also obsolete when compared to modern IR pods used by US Navy (in particular, newest versions of Sniper and Litening pods), being more than a decade old as of 2015. In fact, it is basically an internal version of Sniper XR pod which entered service in 2006, and has low resolution and detection range when compared to the Legion pod. From Sniper XR demo, it appears that identification range is 24 kilometers against fighter aircraft, though the aircraft in question was on the ground, and 45 kilometers against an airborne business jet, showing ID performance at most comparable to PIRATE. This suggests lower maximum detection range as PIRATE likely uses midwave channel for identification, but also has longer-ranged longwave channel. That being said, actual detection range performance may be better than suggested here. Its configuration also allows it quicker scan speeds than with traditional IRSTs. OLS-27 is used on Su-27 fighter, and has a maximum range of 70 km. OLS-30 is used on Su-30 fighters. Maximum detection range might be as high as 90 km, and weights 200 kg. OLS-35 is a scanning array IRST used on Su-35 fighters. Detection range is 50 km head on and 90 km from the rear against a subsonic fighter-sized target. It can track 4 targets. Sensor head weights 60 kg. OLS-50 is IRST for T-50/PAK FA fighter. It is the first QWIP system deployed on Russian fighters, which suggests far higher detection range than earlier systems as well as the ability to identify targets. IRST-21 is a podded system in use with US military. It has field of regard of +-70 degrees (140 degrees) in both azimuth and elevation, and total weight of 67-83 kg. Like other Western IRST systems (and presumably most Russian systems listed), it is capable of generating weapons-quality tracks. While historically IRST had major performance issues, modern IRST systems, especially Western ones, have mostly solved these issues. As a result, IRST can be expected to become a primary sensor in any air war between competent opponents, for the same reasons as those that led to night vision googles being used for night fighting in place of flashlights. While US Department of Defense has a very long history of being “late to the party” when it comes to introducing simple, yet effective (even transformative) systems*, US military is currently taking baby steps to rectifying its lag in development and application of airborne IR sensors. This can be clearly seen from the F-35s inbuilt IRST (though that decision was only made on insistence of US Navy, which was also the first service to introduce the Legion pod, and generally has better understanding of passive IR systems than USAF**), and procurement of IR pods for the F-15C, F-16 and F-18 fleets. Legion pod procured is capable of generating weapons track. US Navy is also the service that initiated development of AIM-9X Block III, which is basically a BVR missile, with a range of 42 km. One of reasons why United States have not put funds into developing IRST, and are even now using almost exclusively systems geared for air-to-ground performance that happen to have air-to-air option, is that IRST was seen as a threat to the AWACS program, and later on also to stealth fighters. Both of these were high-budget programs that USAF could not allow to disappear. With average price of 1 million USD per unit, it would take only 3,2 billion USD to equip the entire US inventory of tactical aircraft with modern IRST systems. Allowing it to threaten the multi-billion AWACS or stealth aircraft programmes was simply unacceptable. *** For this reason, USAF is still acting as if IR sensors have not advanced past Vietnam-era sensors with their range, weather and targeting limitations. Same reason is also likely behind the decision to retire the IRST-equipped F-14 just before the F-22 started entering service (F-14s were retired in mid-2006, while the F-22 started entering service in 2007). * Examples are assault rifles, carrier catapults, IR sensors, helmet mounted sights, HOBS IR missiles. ** US Navy was also the first service to deploy IR Sidewinder missile in 1956. US Air Force deployed a Falcon missile the same year, but it had both IR and RF variant, and unlike Sidewinder, it was primarily intended for bomber self-defense and not for usage on fighters. Even though it was later deployed on fighter aircraft as well, USN Sidewinder proved superior and became preeminent US IR air-to-air missile. *** E-3 Sentry program cost is 26,73 billion USD, F-22 program cost is 79,48 billion USD and F-35 program cost is estimated at 323 billion USD, though it is likely to be higher. This entry was posted on June 16, 2015 at 6:00 am	and is filed under technology. Tagged: airborne infrared, airborne infrared search and track, airborne infrared sensors, airborne IRST, counter-stealth, fighter aircraft IRST, FLIR, infrared search and track, infrared search&track, irst, IRST counter-stealth performance, IRST performance, performance, vs stealth. You can follow any responses to this entry through the RSS 2.0 feed. You can leave a response, or trackback from your own site. BVR, long distance (over 30 Nm), and bombing. Could you explain me in few words why concurrency is made specificaly to increase costs? I’m sure you have arguments, but i’m totaly blind about the subject. Placing a weapon system into production before development is finished has quite a few effects, none of them good. First, it means that testing is ongoing even as production aircraft are leaving the line. This means that fixes for any problems that *will* be discovered during testing have to be retroactively applied to already finished aircraft, which is more costly than modifying a design not yet in production, especially if it means modifying production tools. Second, initial production rate will be low, which increases per unit price. Third, it means that the weapon will be harder to cancel regardless of (lack of) performance, reducing the need for design and cost discipline. And by doing that, they know that from the very beginning, the programm will fall in the “to big to fail” spiral? Well, to be honest concurrency has some advantages, but you have to take the context into account. Since the US forced have chosen an “all in” approach on what became the F35 they have halted (or drastically slowed down) production and upgrades to their current fleet. This means they now have an aging fleet and concurrency enable them to say they already have planes “on the field”. This is a way to hide the time needed to conceive and produce a modern airplane. Also the armed forced are provided with the new plane earlier which enables pilots to train on the new plane as of now. This also enable pilots of past airplanes being decommissioned to have something to fly. For example the 1st Rafale provided to the French navy where nowhere near the actual capacity of the plane but they had to be delivered in 2002 as the earlier carrier-capable had to be decommissioned and a carrier without airplanes is too expensive of a joke. Finally concurrency wasn’t needed for the F35 program to be “too big to fail”. Italy and England are building aircraft carriers that require their fleet to have STOL capabilities. With that big of an investment they are committed to buying at least the F35-B variant. Also LM does not need to have a very good airplane: they already won the competition in the US more than 10 years ago. Most of the orders where placed before the plane flew, since then it had way more cancellations than new orders. Those who need the F35 to perform well are the Italians who invested in a production line for European exports: If the sales in Europe plummets they will not be able to pay off the investment in the assembly line (let alone their carrier). The program became “too big to fail” as the approach of one-plane-fits-all got set in stone and no concurrent project was financed. I have no problem with adding capabilities later. What I do have a problem is having airplane in production before (potentially lethal) kinks are worked out. From the results of the past few attempts at “concurrency”, we’ve seen nothing but disasters – aircraft, ships, you name it – that have come overbudget and underperforming below expectation. They tried to push serious technology before extensive testing and a more incremental approach. With all this in mind, one has ask why the Pentagon thought putting such a large asset, both in expenditure and size, into production with such an immature set of core subsystems that also happen to be nearly impossible to replace with proven ones, was a good idea? It’s not as if existing arresting gear, catapults and radar systems, or the previous Nimitz Class design for that matter, are ineffective. Including all these immature sub-system into a carrier that costs more than $13 billion assumes massive amounts of totally avoidable risk. Unlike the F-35, we do not have the luxury of building hundreds, or even dozens of Ford-class carriers in the near term in order to “eventually get it right.” What happens if the ship’s core technologies, namely its launch and recovery systems, are simply not in an operational state by the time the ship is supposed to formally enter the fleet? What cost will such a delay bring to the program’s already ballooning budget? Then there are also the operational and end-strength issues as the Navy is already experiencing a critical ‘carrier gap’. What’s worse is that it may not even be possible to retrofit this giant vessel with proven “legacy” systems, such as hydraulic arresting gear engines and steam catapults, if their newer, high-risk alternatives prove to be far from reliable. And if these new systems aren’t reliable at all, they’ll need to be taken out. Which means cutting the entire carrier apart. Alternatively, the Gerald R. Ford will be a harbor queen until these systems are developed to a point that they work reliably. Concurrency genuinely does look great on paper, as it shows that old assets can be replaced with new ones on an incredibly tight schedule, along with laughably optimistic cost predictions. But in reality, the practice ends in a desperate scramble to fix issues as they come up, as well as fiscal and political hell. Our military is already a shadow of what it was a decade ago, and due to the concurrency blunders of yesterday and today, our forces will eventually collapse in on themselves economically. Alternatively, at the very best, we will own 2500 F-35s and a handful of Ford-class carriers that we can’t even afford to operate, and that are too temperamental to do their predecessor’s job reliably. When it comes to procurement, concurrency is chaos, and it must be stopped. I don’t agree with the author on everything he writes, but on this one, he nailed it. OSF IT (last OSF generation) onboard Rafale has no IR device. What looks like IR device is a dummy one to respect aerodynamics and centering. MICA IR has better performance than the IR from OSF in scan mis. MICA IR is part of data fusion, in consequence, its informations are directly visible on the tactical situation. TV (New version, called IT) of OSF is seen as essential by pilots and could be the best device of this kind in the world for now. Close to IR spectrum, it’s an all weather, day/night device. Used as well in air/air than air/ground long distance identification and telemetry. In my opinion, if the pilots consider that device as their tool of choice, that meens it is easy to operate, has a great range and reliable for identification. Damocles in air/ground mod, is part if data fusion too, its informations are visible on the tactical sutuation. Link 16 can be used to give a target to the Damocles pod. Damocles + AASM Laser seem to give one of the best (if not the best) range/precision performance avaible on any fighters now. Damocles is used as well in air/ ground and air/air (no data fusion in that case). Future pod named “Talios” will have the same/better performances + much better image quality and overall performances at short distance, that seems to be be the weak point of the Damocles pod. DDM ng can give by its own, primitive firing solution. SPECTRA not only works for self defence, but gives total firing soulutions too. If active cancellation is not confirmed, “déception” jamming seems to be. It’s the ability to give back a wrong aircraft position to the adverse radar tracking you. Could you please provide links. I don’t mind if they’re in French, I read it very well. 😀 Or if you got the information from an actual visit to the show, photos and/or video. Last informations i gave, come from a post from air-defense.net + personal informations. The post is from PolluxDeltaSeven. He is someone serious. He was at Le Bourget ( where he has his sources) as he does every two years. Thank you very much for the links and photos. Here’s a tidbit for you. As I understand it, Iraq’s sole A2A kill during Desert Storm was achieved by a MiG-25PD against an F-18. I don’t know all the specifics but I do know some key factors which allowed it to happen. 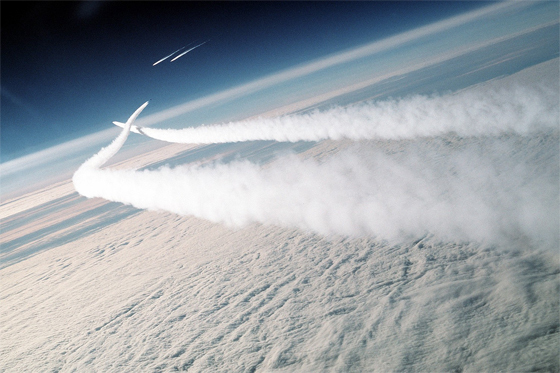 1) The F-18s detected the MiG with their radar and asked AWACs if the unknown contact was hostile. AWACs repeatedly stated it was not. The F-18 flight therefore did not act appropriately. There are lessons to be learned here as I don’t know where the breakdown in IFF can be appropriately attributed. 2) The MiG probably used its IRST to intercept the F-18 flight. If I recall correctly it pulsed its radar (“one ping only, Vasily”) to verify range to target. 3) The MiG used its superior sustained speed to run the F-18 flight down from behind. 4) The MiG probably used a long-range IR missile, the IR variant of the R-40, to kill the F-18 from behind. In fact I am surprised it killed only one F-18 as the R-40 is the size of an AIM-54 Phoenix and has rather large frag radius. I’ve always been a fan of the Foxbat and though it might have the low-speed maneuverability of a whale there are still plenty of possible situations where you’d damn well better give it the appropriate respect. It is regrettable we had to lose a pilot this way. Thanks. Shows importance of IR. I don’t suppose I have to point out that this was the downgraded export variant of a 1980’s semi-modernized 1960’s interceptor flown by an Iraqi pilot. Although counter-intuitively the Iraqi pilot might have been rather experienced in air to air combat, considering the Iran-Iraq conflict. I suspect the MiG detected the F-18s from beyond visual range with a RWR but I can’t be sure if it was equipped with such. Whoever he was, he knew enough to not use his radar except very briefly in the last stage of the intercept, to get a firing solution for his fire control system. Had the MiG been broadcasting when the F-18s were first concerned with him, their own radar warning receivers would surely have identified him as hostile. So this incident not only shows the 1)value of an IRST, but also 2)the value of sustained speed performance, 3)beyond visual range target identification, and 4)long-range infrared-guided missiles. 1)Even without range data an IRST allows intercepting a target simply by flying a course in which target bearing rate is zero, particularly if ownship has high speed. 2)A foxbat holding its maximum 32000lbs of fuel was ideally capable of holding mach 2.35 for 40-some minutes, and was allowed to go beyond mach 2.5 for a few minutes at a time. All this carrying 4500lbs of missiles. A hornet is barely supersonic compared to a Foxbat. 3)I suspect the MiG’s rules of engagement probably made matters easy in this regard, as anything he found flying around with radar on was surely the enemy. 4) In a tail-chase scenario, an infrared seeker can ask for no better target than a fighter jet, but it takes some serious kinematics to run one down. The R-40 was no slouch in this regard; this 1100lb air-to-air missile is significantly larger than many middleweight SAMs. Actually, there wasn’t much air-to-air combat in Iran-Iraq war, Iraqis won by default when Iran ran out of spares for their aircraft. And yes, you are correct in what you write, I didn’t have time to analyze it in detail. Few notes, Foxbat IIRC has very high fuel fraction, and fuel fraction is actually more important than total fuel load (though latter does play part as well).